Gujarat Vidyasahayak Bharti 2018 Std. 1 to 5 & Std. 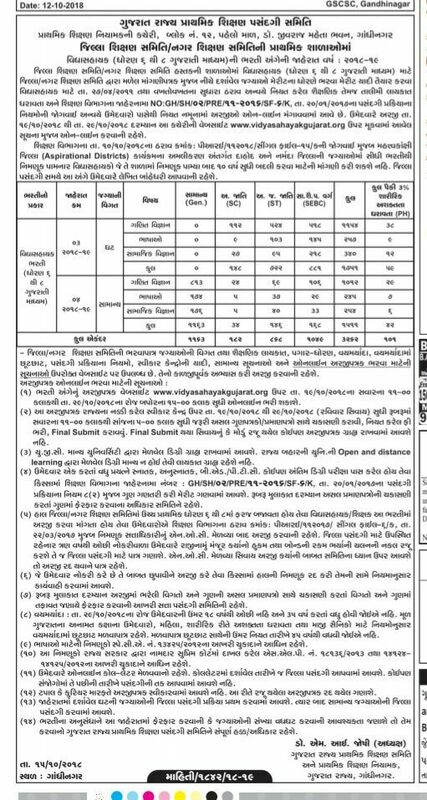 6 to 8 for Other Medium Apply Online for 1026 Teachers Bharti at www.vidyasahayakgujarat.org : Gujarat vidhyasahayak Recruitment/Bharti 2018 for Teachers in Primary School Other Medium Std. 6 to 8. There are total 1026 Vacancies for Teachers in Gujarati Primary School. Out of them 542 is for Head Teachers. Vidhyasahayak Bharti Notification Advt. (Jaherat) Official 2018 Published in Today’s Various Gujarati News Paper like Gujarat Samachar, Sandesh, Divyabhaskar, etc. you can see News Paper Cutting below.